Adult lifetime cannabis use by country is the lifetime prevalence of cannabis use among all adults in surveys among the general population. Lifetime prevalence means any use of cannabis during a person’s life. Unless another reference is indicated (see “References” column) all the data comes from the European Monitoring Centre for Drugs and Drug Addictions statistical bulletin from 2007. Note: The table is sortable in various ways. Click the sort button cell at the top of the column you wish to sort. Click again to reverse the order of sorting. Age range is the range the data computation is based on. Lifetime prevalence of cannabis use among all adults (aged 15 to 64 years old) in nationwide surveys among the general population. Data taken from EMCDDA (European Monitoring Centre for Drugs and Drug Addiction). Click the image for more info. See the chart for the exact percentage of cannabis use for each country. ^ a b c Table GPS-8 Part (i) “Lifetime prevalence of drug use among all adults (aged 15 to 64 years old) in nationwide surveys among the general population” Archived 2008-04-09 at the Wayback Machine. 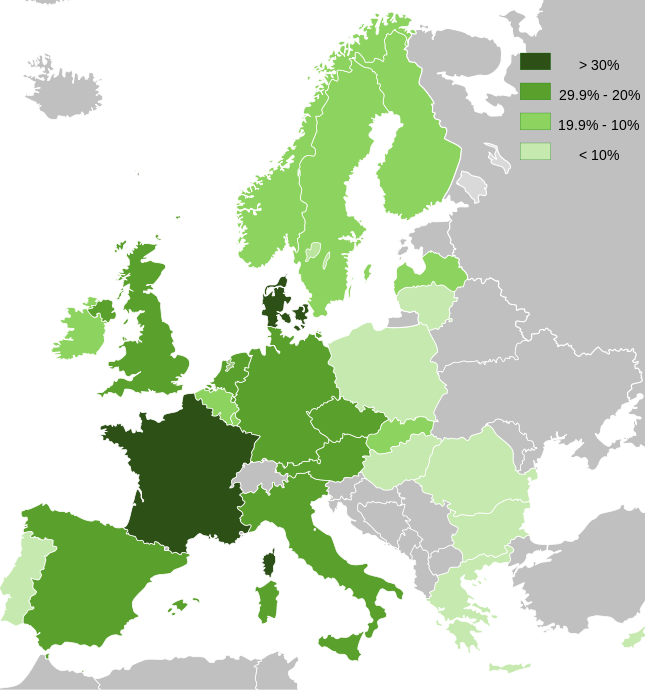 Statistical bulletin 2007 (archive), EMCDDA (European Monitoring Centre for Drugs and Drug Addiction). ^ a b c d e f g h i j k l “Toward a Global View of Alcohol, Tobacco, Cannabis, and Cocaine Use: Findings from the WHO World Mental Health Surveys” Archived 2018-01-12 at the Wayback Machine July 2008, Volume 5, Issue 7, e141. PLoS Medicine (Public Library of Science). In the full article[dead link] see Table 1 for the survey dates, and participant ages. See Table 2 for the percentages of use by country. ^ Methods and definitions Archived 2009-02-02 at the Wayback Machine. EMCDDA. ^ “Policing and cannabis use in Australia”. NCPIC. Archived from the original on 25 May 2012. Retrieved 3 December 2011. ^ “Wayback Machine” (PDF). 2011-10-06. Archived from the original (PDF) on 2018-03-22. Retrieved 2018-03-22. ^ “Las drogas y su impacto – CEDRO”. 2013-09-26. Archived from the original on 2018-03-22. Retrieved 2018-03-22. These Are The European Nations That Smoke The Most Pot. By Nick Jardine. 18 October 2011. Business Insider.